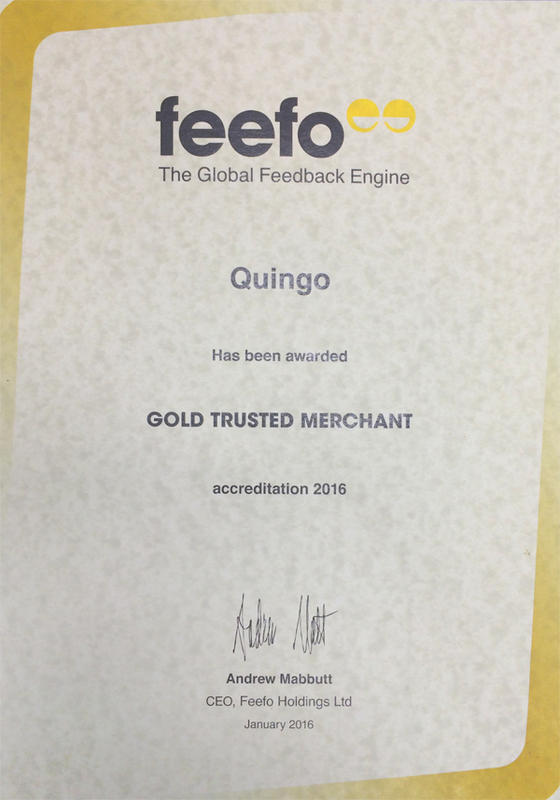 Quingo’s exclusive UK distributor Forever Active have won the prestigious Gold Trusted Merchant Award from Feefo for the second year running. This is unique in that it is based on the experience of genuine customers who have purchased products, and all results are completely independent of the merchant. We strive to offer the best customer experience and product we can, and to know that our customers are happy is a fantastic reward. We would like to take the opportunity to thank those customers who have offered their feedback for us and our products. Would like to compliment one of your employees who helped my 86 year old mother yesterday. Outside ASDA on Rochdale Road her walker broke and spilled her shopping out all over the road. Not only did the Quingo young man help pick up her shopping and get her safely off the road. He parked his van and walked her home which is about 25 minutes away at my mums pace. Unfortunately I wasn’t in when this happened but would like to send him my biggest thanks for his efforts yesterday. She can’t remember his name but thinks it was either Simon or Stephen. If you could pass this on I would be ever so grateful. Stephen Owens didn’t mention this to anyone at Quingo, thinking of it as “just part of his day”, as he said “Anyone would have done the same”. You can discover more about the offers by clicking the links below. You can read more on our blog post about the exciting new Quingo contract hire scheme. This week there was a special guest on popular Yorkshire-based soap Emmerdale – the Quingo Vitess! Watch the scene in the clip below. Doesn’t she look good?! Quingo Scooters are the 5 wheel mobility scooter, offering the worlds only 5 wheel configuration with Quintell Technology. Quingo Scooters combine the balance of a four-wheel scooter with the mobility and agility of a three-wheel scooter. Other benefits include much greater comfort, control and advanced postural support.